Bubsy in Claws Encounters of the Furred Kind allowed the title character to become Accolade’s mascot, being one most successful Western console games of 1993. Despite the game’s success, series creator Michael Berlyn left the team shortly after its release. Despite this, Accolade wished to keep their character’s success going, and commissioned a sequel. However, because Accolade nearly went bankrupt developing Bubsy, this new team had nothing but contempt for Mr. Berlyn’s character. They made it clear in interviews they were forced to make a follow-up and didn’t care about its quality. This apathetic team ended up making two games: Bubsy II and Bubsy: Fractured Furry Tales. Both debuted in 1994; the former on many of the same platforms as the original and the latter on the ill-fated Atari Jaguar. The little amount of care that went into these works was evident. While Bubsy II made marginal improvements to the gameplay, Fractured Furry Tales proceeded to mimic the original. Not surprisingly, Bubsy II ended up receiving more acclaim from critics. Mr. Berlyn made it no secret that he hated both games, as he was not involved in their creation. Fortunately for him, he was about to get a chance to make a triumphant return. The second and third installments of the Bubsy series did not fare well commercially. Therefore, Accolade approached Mr. Berlyn to develop a new installment in their rapidly sinking franchise. He agreed to their terms under one condition: the new game was not to be a retread of the original. Moreover, he sought to set his sights higher by doing something the gaming world, by and large, had never seen before. His team was to explore uncharted territory by making this new installment a platforming game with a fully three-dimensional presentation. The amount of ambition that went into this game was truly remarkable. 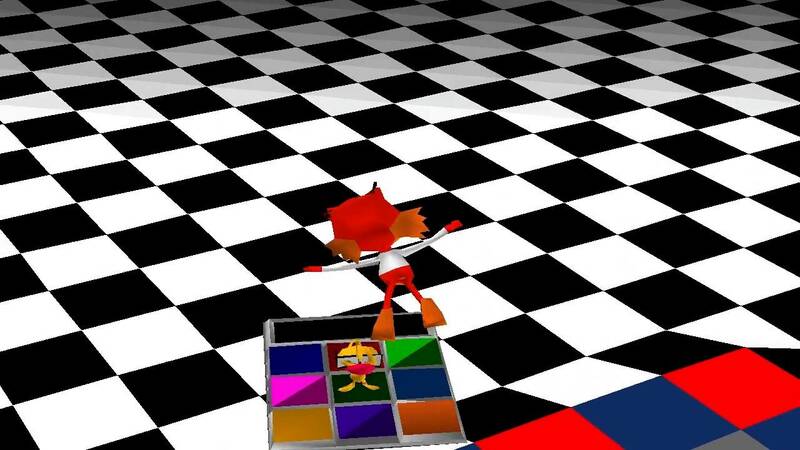 Characters models would be composed of flat, shaded polygons, it was to feature cutscenes animated by hand, and Mr. Berlyn intended to give Bubsy a true voice. 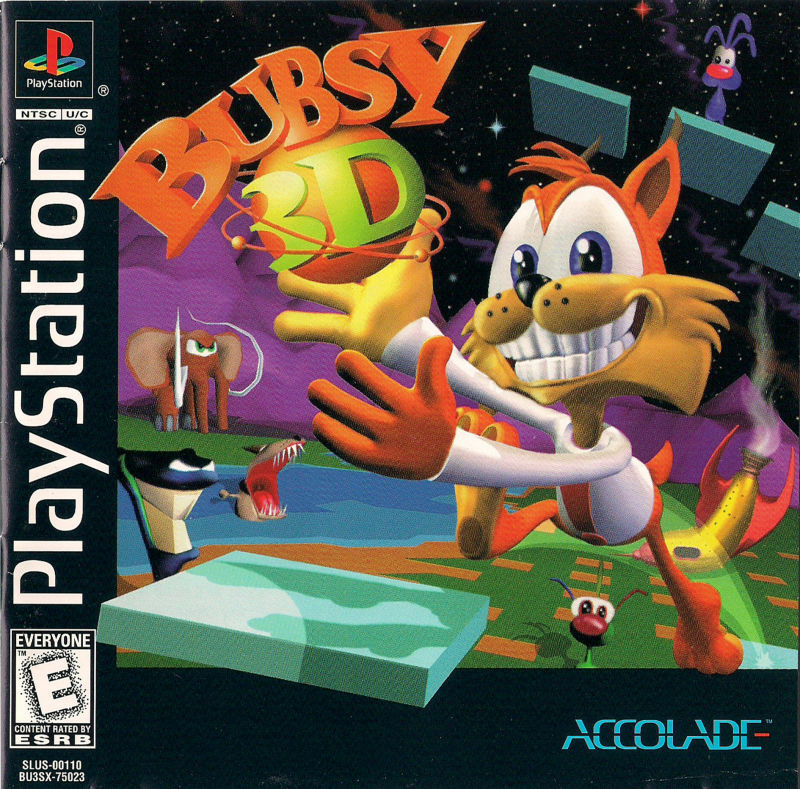 Satisfied with how the game was turning out, Mr. Berlyn attended the Consumer Electronics Show in January of 1996 in order to demonstrate the beta of their work – aptly named Bubsy 3D. While he likely intended to make waves, little did he know that he was about to receive a brutal wake-up call. As early as 1991, Shigeru Miyamoto of Nintendo had been playing around with the idea of a three-dimensional game starring his company’s own mascot, Mario. A mere five years later, he and his team were bringing this vision into reality in the form of a game named Super Mario 64. Mr. Berlyn realized after seeing its beta that his own game was vastly inferior to Nintendo’s offering. 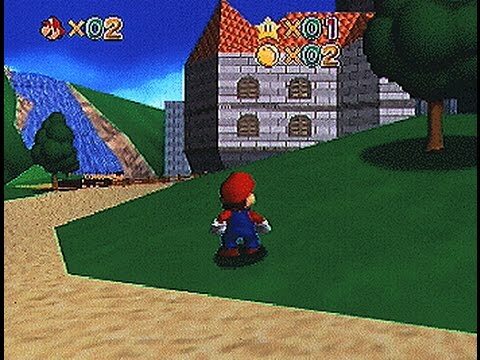 Indeed, Nintendo had stopped at nothing to ensure Super Mario 64 was as polished as they could make it, and delayed the game’s console, the Nintendo 64, to June of 1996. This was a luxury Accolade didn’t have. To make matters worse, another developer named Naughty Dog was about to enter the console business by having their own 3D platformer, Crash Bandicoot, debut on the PlayStation. This would ensure direct competition between it and Bubsy 3D. Mr. Berlyn, realizing he couldn’t take what he learned from watching the Super Mario 64 demonstration, vowed to use the little remaining time to make Bubsy 3D as good as possible. The game was released in November of 1996 – five months after the domestic release of Super Mario 64. Despite being seen as an overall worse effort than Super Mario 64, Bubsy 3D managed to receive mixed reviews, earning acclaim from sources such as GameFan, GameZilla, and derision from others, including Next Generation and Electronic Gaming Monthly. Despite this, PSExtreme was particularly enthusiastic about the game, giving it 93% and their “Gold X Award”. The reviewer in question compared it to a Warner Brothers cartoon. Against the truly fearsome Nintendo, how has Mr. Berlyn’s effort fared in hindsight? A bobcat named Bubsy had done battle against a horde of aliens called Woolies. These aliens had a decidedly strange modus operandi; they sought to steal the Earth’s supply of yarn balls. Bubsy successfully repelled the invasion, but the Woolies are not interested in taking this defeat gracefully. Led by their two queens, Poly and Esther, the Woolies invade Earth and kidnap Bubsy. However, the bobcat ends up escaping his captors when the ship malfunctions and crash-lands on Planet Rayon. In order to escape the planet, Bubsy must build a ship using the various atoms and rocket parts. As both items are considered worthless by the Woolies, they cannot comprehend his motives. Nonetheless, they will stop at nothing to destroy their archnemesis once and for all. I have to commend Mr. Berlyn’s team for attempting to make this game at all. Bubsy 3D was being made during a time in which 3D gaming hadn’t fully cemented. When he made the original Bubsy, he had various games he could use as a point of reference – Sonic the Hedgehog just happened to be the one he chose. When it came to 3D gaming, he had nothing to use as a style guide. The Texas-based developer id Software had experimented with the idea of 3D gaming via their successful first-person shooters Wolfenstein 3D and Doom. However, neither of these games were three-dimensional. Instead, they were two-dimensional games cleverly programmed so as to depict the illusion of depth. Nintendo was in the process of creating the blueprint for true 3D gaming, but by the time Mr. Berlyn knew of its existence, he couldn’t do anything with his newfound knowledge. The reason I choose to mention all of this upfront is because, as ambitious as Bubsy 3D is, playing it for any length of time reveals it to be a complete mess from top to bottom. The original had the courtesy to wait before bombarding players with its confused stage design, terrible controls, and overall poor optimization. All of these problems and more are observable in Bubsy 3D before you’ve even reached the first checkpoint. Just like with its three predecessors, the crux of its awfulness lies in its controls. While you could theoretically use the PlayStation’s control pad to move Bubsy, you’ll soon discover that he isn’t really capable of moving in a direction other than straight forward. During the tutorial stage, you’re instructed to gather as many atoms as possible. This proves to be a monumentally difficult task because you can’t reliably turn Bubsy as he’s running. In order to change direction with any degree of precision, you have to wait until Bubsy comes to a dead stop and then press left or right on the control pad. The idea of pivoting your character as though they were a tank isn’t bad in of itself, because it demonstrably worked in games such as Alone in the Dark and Resident Evil. However, both were claustrophobic survival horror titles with slow-paced gameplay. It absolutely doesn’t work in a platformer wherein not pressing a button at the right moment could be the difference between success and failure. Even then, and owing to the control pad’s binary nature, Bubsy has exactly two speeds: running and stopped. This makes attempting to reliably navigate platforms a nightmare. The game does show some mercy in that Bubsy will automatically latch onto a platform if he is close enough to it, but it is of little solace. It especially doesn’t help later on in the game when you’re negotiating moving platforms or conveyor belts – the latter of which cannot be latched onto. Although the controls themselves make it nigh impossible to get anywhere, the actual layout isn’t terribly great either. Counterintuitively, there are two separate buttons for jumping: the “X” button and the triangle button. The “X” button allows Bubsy to jump normally. The triangle button, on the other hand, causes him to jump in the air and then glide, which only works if you hold it down. 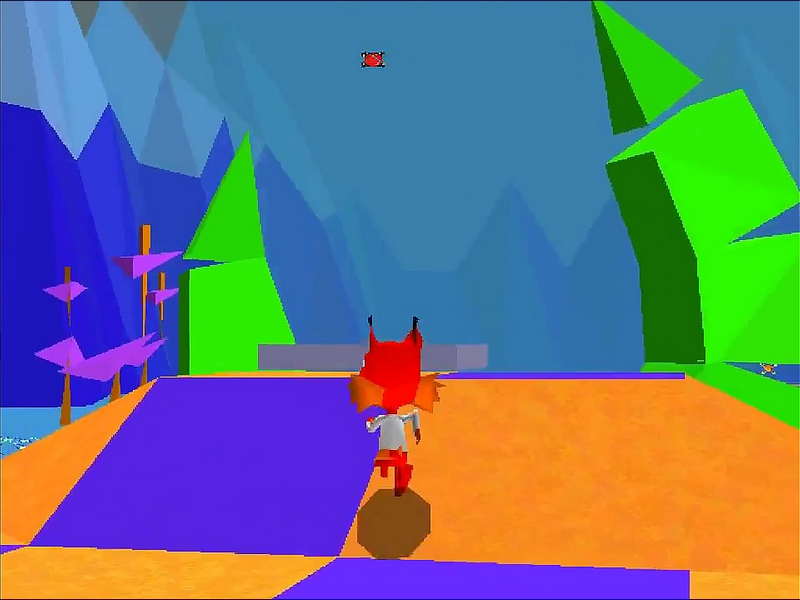 Unlike in preceding games, there is no fall damage, yet gliding would appear to slow Bubsy’s descent. If you were wondering why anyone would not want to glide, the reason is because the standard jump gains a bit more height. This means the gliding jump is intended to have Bubsy cover more distance. However, there is no definable reason to have two separate jump buttons. If players had any control over Bubsy’s momentum, they could use that to easily make any jump. In this game, you have to take a few seconds to remember which jump button to use in a given situation before pressing it. Another problem that players will notice right away is how boring the graphics are. Owing to the game’s rushed development cycle, the team only got an alpha build completed by the time they reached the deadline. In the version the team dubbed a finished product, walls and floors are all made up of bland checkerboard patterns. If this game’s reputation didn’t precede it, somebody unfamiliar with Bubsy 3D would assume any given screenshot was lifted from a technical demonstration or a test area never meant to be accessed by players. The only real distinctions between stages are the color schemes and the backdrops. Otherwise, one had best get used to this layout, because every stage in the game looks like the first. It is said that graphics are not the sole deciding factor when it comes to assessing a game’s quality. This is entirely correct. After all, Bubsy 3D, being one of the first three-dimensional platforming games couldn’t have helped but aged in the years since its debut. The graphics being merely being bland would be a big weakness, but not a fatal one. What causes the graphics in Bubsy 3D to actively detract from the experience is that it barely looks like a finished product. 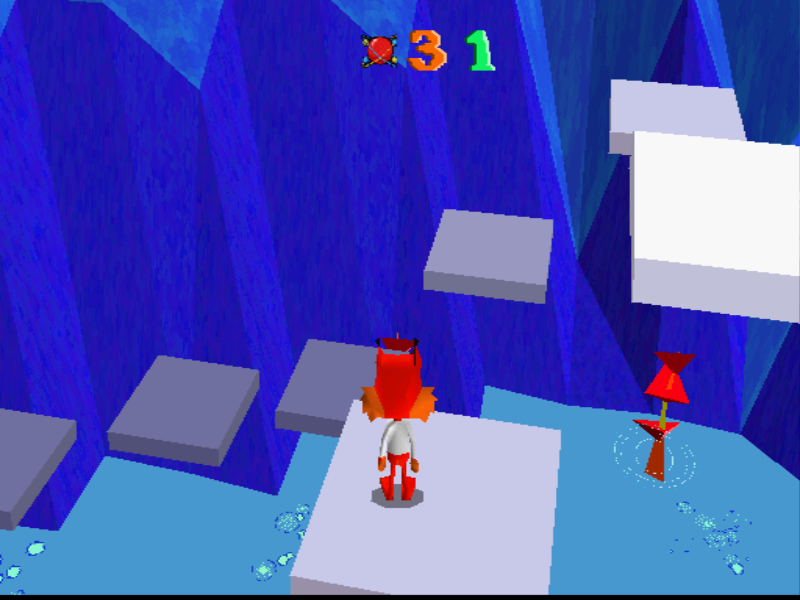 The abstract object in the above screenshot upon which Bubsy is standing is a switch. It barely looks any different from the various cubes floating around, making it easy to mistake for a decoration. To the developer’s credit, and unlike in this game’s two-dimensional predecessors, most of these switches actually tell you what they do once activated. This still practicably involves running around the stage looking for the activated prop, but you will at least know what to look out for. Otherwise, the biggest problem with the graphics is that it’s nearly impossible to distinguish anything. You will be wandering around a stage only for it to fade to black. The next thing you know, Bubsy is drowning in a body of water. Just like in previous outings, Bubsy, being a cat, does not suffer water gently. In fact, merely touching water causes him to drown instantly. While it was exceptionally annoying to deal with in the original Bubsy, you could, at the very least, see the surface of the water. This isn’t nearly as simple in Bubsy 3D. Water has the same exact non-shaded texture as everything else. You can occasionally see bubbles popping on the surface and the texture is an appropriately colored cyan, but you’re unlikely to notice this until you’ve fallen victim to it at least once. As you’re navigating Bubsy, you will eventually notice that you have no control over the camera. It is always pointed directly behind Bubsy’s back when he is in motion. When he jumps, the camera faces down, allowing players to gauge what lies below. Though it wasn’t obvious at the time, being unable to control the camera makes the game even more of a chore to play. I will admit that the camera facing down whenever Bubsy jumps wasn’t a bad idea, but without the ability to control it at all, you will have extreme tunnel vision playing this game. Because you can’t easily perceive your surroundings, you will be astounded how often you get blindsided by an enemy attack or fall victim to a hazard that seems to come out of nowhere. 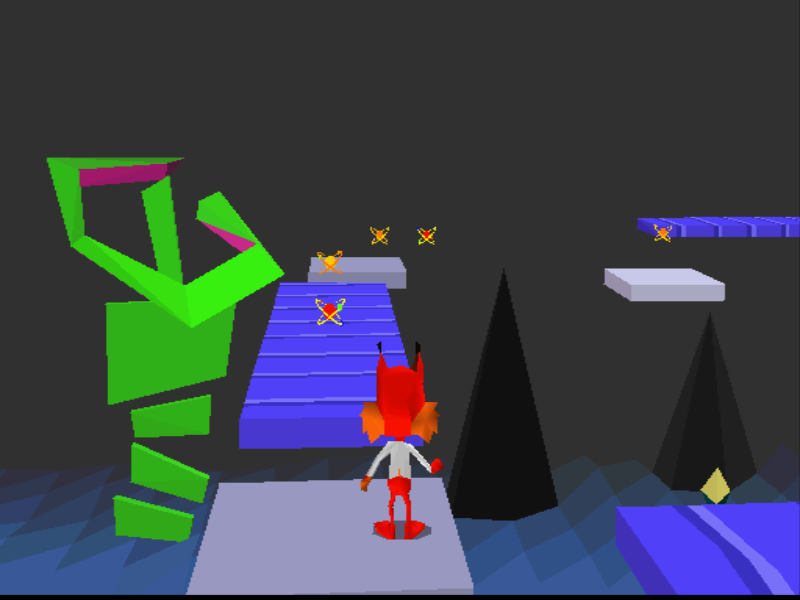 Given the treasure trove of problems present in the rest of the game, it comes as no surprise that fighting enemies in Bubsy 3D is exceedingly difficult. Unlike their two-dimensional counterparts, the Woolies in this game have an overwhelming advantage over Bubsy. Though most of them are stationary, they have a ranged attack that is amazingly difficult to dodge owing to the game’s poor controls. As long as there isn’t an obstacle between them and Bubsy, they will land a hit every single time. Just like in Bubsy II, the title character can take multiple hits without dying. Unfortunately, taking damage here is far more detrimental than it was in Bubsy II. This is primarily because health pickups are much rarer in Bubsy 3D. If that wasn’t enough, getting hit turns the camera to face Bubsy’s dazed, dumbfounded expression. To begin with, this is highly disorienting. When the camera turns around on its own, you could easily get the impression you can move in that direction the second you regain control. This isn’t the case at all; only when the camera positions itself behind Bubsy once more can you move him. The bigger problem with this aspect is that you cannot move Bubsy at all when he is sitting on the ground dazed. In most platforming games, if the main character takes damage, they are knocked back slightly and they are usually granted a brief duration of invulnerability. In Bubsy 3D, you have to wait several seconds before you’re allowed to move again. It’s like being subjected to a load screen every time you make a mistake. On top of the long load screens you must endure whenever you select a stage, you have a game seemingly tailor-made to waste your time. The reason Bubsy will take damage frequently is because he isn’t afforded many ways to fight enemies. Your primary method of doing so is going to be the one that has endured throughout the entire series: jumping on the enemies’ heads. That is pretty much all Bubsy has going for him; he is the same useless protagonist he was in his inaugural title. He doesn’t get any power-ups or items with which to make the game easier. In fact, thanks to the technical limitations of the PlayStation, he isn’t even particularly fast on his feet anymore. Technically, he does have a secondary means of attack. By running up to an atom and pressing the square button, he can launch it at his enemies. This is unnecessarily difficult to do for a number of reasons. First of all, you can’t actually collect the atom you want to throw at an enemy. If you do, you can’t discard it and throw it. Secondly, if you take too long to aim the atom, Bubsy will take damage when it explodes. It takes an extraordinarily long time for Bubsy to turn around when you’re aiming the atom. You will instinctually want to latch onto the atom as soon as possible because Bubsy can’t take damage when he is aiming. However, this proposition doesn’t work if the enemy is behind him. Given how bad the controls are, aiming with any degree of precision would be difficult even if the atom didn’t explode. Thirdly, and most damningly, the atoms can only be launched straight in front of him. This means if the enemy is at an altitude higher or lower from Bubsy’s current position, you cannot use the attack at all. The fact that Bubsy’s sole reliable method of attacking involves jumping on enemies is bad enough, but his limited repertoire is worsened by one simple factor: the hit detection is atrocious. Bubsy has to be right above his enemy for the attack to count. If you miss, the enemy will usually have enough time to launch a counterattack. While defeating enemies by jumping on top of them wasn’t particularly inspired by 1993, a novice could grasp the idea easily enough in the original Bubsy and its sequel. Owing to its subpar controls, you run the risk of damaging the title character every time you fight enemies in Bubsy 3D. What makes Bubsy’s horrible survivability especially grating is that the developers made him even obnoxious than he ever was in the series’ side-scrolling installments. Bubsy being ungrateful for the player’s help at the end of the original game was bad enough, but it has nothing on the insufferably inane one-liners he spouts out every other second in this installment. Whether he defeats an enemy, takes damage, or otherwise succeeds at some kind of task, he will open his mouth and loudly yell about his predicament. It is even more annoying than it sounds. If by some remote chance anyone was morbidly curious to try this game out for themselves, they would do well to mute the television screen lest they run the risk of going insane. While you can get away with avoiding conflict for a majority of the experience, this proposition comes to a dead stop whenever you fight a boss. Considering the game’s abysmal track record in every other aspect, it’s not terribly surprising that the boss fights fare no better. The first boss fight pits Bubsy against the Woolies’ head scientist. Every single problem with the game can be observed in this short sequence. You need to dodge his fireballs. When they hit the ground, they will heat the surface of the arena, creating an updraft. 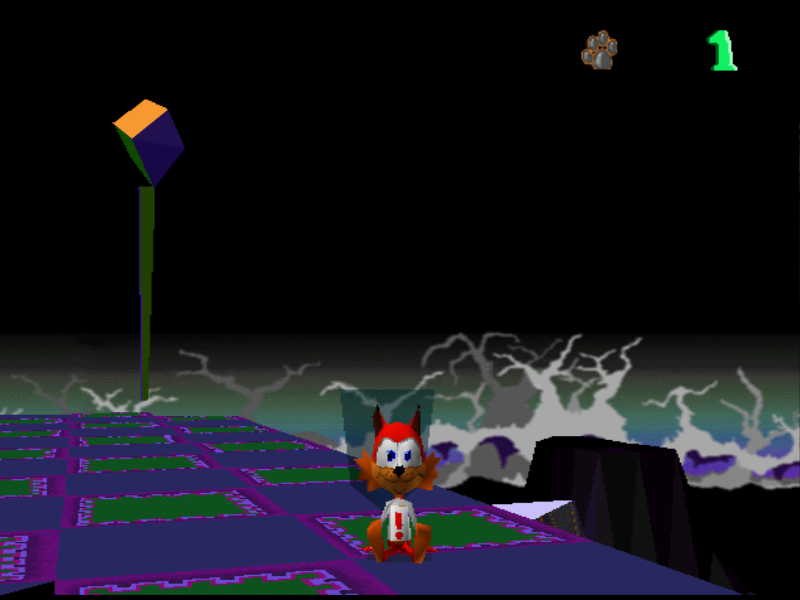 By gliding above the heated surface, Bubsy can rise up and land on top of the scientist to damage him. Because his platform moves faster than Bubsy and the hit detection is tenuous as best, you just have to hover over his general area and hope the attack connects. After an easy second boss, the game’s difficulty spikes to truly unbelievable degrees in the final stage. Just reaching the final boss is an exercise in frustration, for you have to active a series of switches in a specific order while smaller Woolies are swarming Bubsy. They’re some of the only enemies capable of moving, and because they cannot be defeated, you will take a lot of damage trying to figure out the intended sequence. If you do and make it to the final boss’s lair as a result, you will wish you never bothered. Bubsy’s battle against the Woolies’ queens requires you to have mastered the atom-throwing mechanic. Because there was never a pressing need to before this point, the average player will have no idea what to do – only that jumping on them proves ineffective. To win, you must activate a switch, which will open a case containing an atom and throw it at them. Words cannot express how difficult this is to accomplish without getting hit by one of the queens’ lasers. You can’t move the camera, ensuring you will get hit by an attack you won’t see coming. Because the queens dart around a lot, you will find yourself taking too long to aim the atom – at which point, it explodes. On top of that, you only have a limited time to reach the atom before the switch stops. Once it does, the atom will be enclosed in a glass case once more. It is both a blessing and a curse that there is no time limit in this game. You can fight the boss at your leisure, but it also means that you’ll spend more time playing Bubsy 3D. Should you prove tenacious enough to defeat the queens, you will have finally completed the game. Alas, Bubsy’s victory is short-lived. His rocket ship has not the power to make it to Earth, stranding him in space. Without a hero to repel these unfettered foes, the Earth is completely at the Woolies’ mercy. Throughout the stages are rocket parts you were supposed to collect. Should you fail to get them all, this is the ending you receive. 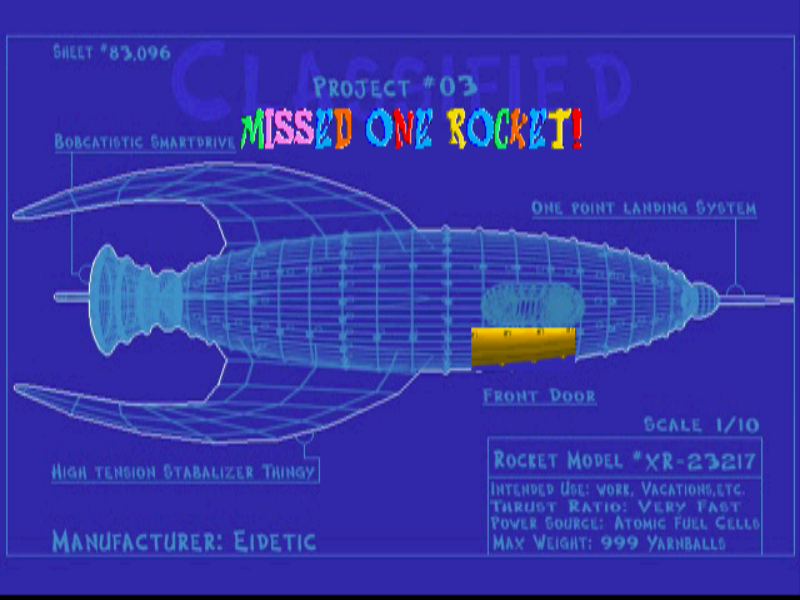 Only by thoroughly exploring the stages will you find the rocket parts needed to return Bubsy home. 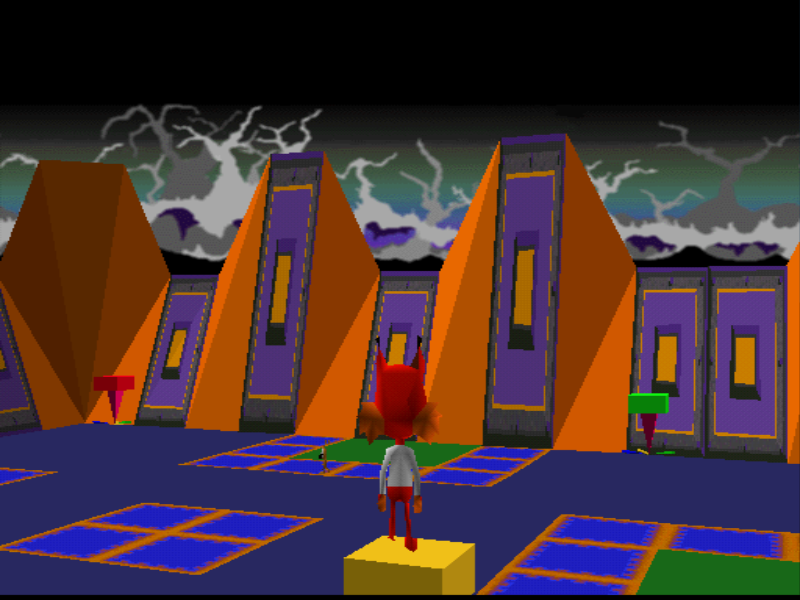 It is when you choose to do so that you get a sense of how, once again, Bubsy’s game contains some of the most confused stage designs you will ever see. From the series’ inaugural installment, Accolade didn’t exactly demonstrate their mastery of sensible level design, turning players loose in an environment that couldn’t decide whether it was part of a fast-paced action game or a slow, methodical pseudo-Metroidvania. This problem only became worse in the series’ second installment when the stages made Bubsy run all over the place to reach the goal. While the three-dimensional presentation does alleviate some of the worst aspects of this problem, it is still apparent. The developers graciously placed arrows in the game in order to guide players to the goal, but they aren’t always helpful. It doesn’t change that whenever the path to the goal deviates even slightly, you will seldom have any idea where to go. Reaching the goal by itself is a nightmare because just like in Bubsy II, stages just stop out of nowhere with no buildup. Looking for the rocket parts makes the already frustrating experience even worse. Any extra time you spend in a given stage runs the risk of you taking excessive damage or otherwise falling into a death pit. Although this is true of most games, you’re not actively thinking that if it’s well-made. After painstakingly finding each and every rocket part and defeating the final boss, you will get the best ending. Alas, Bubsy’s victory is short-lived. His rocket ship has far too much power. The power core overloads, sending him back to prehistoric times. Without a hero to repel these unfettered foes, the Earth is completely at the Woolies’ mercy. You go through all of this trouble to collect the rocket parts only to be told your efforts were completely pointless. This was probably intended to be a sequel hook, but in light of the game’s dismal performance, the original developers never had a chance to make it. As it stands, Bubsy 3D has one of the most infuriating endings in gaming history. It makes a strong case that when it comes to playing Bubsy 3D, the only winning move is not to play. The story of Bubsy 3D is, in a lot of ways, one of the biggest tragedies in gaming history. Mr. Berlyn and his team clearly wanted to make a good game, and they deserve credit for braving an unexplored world. 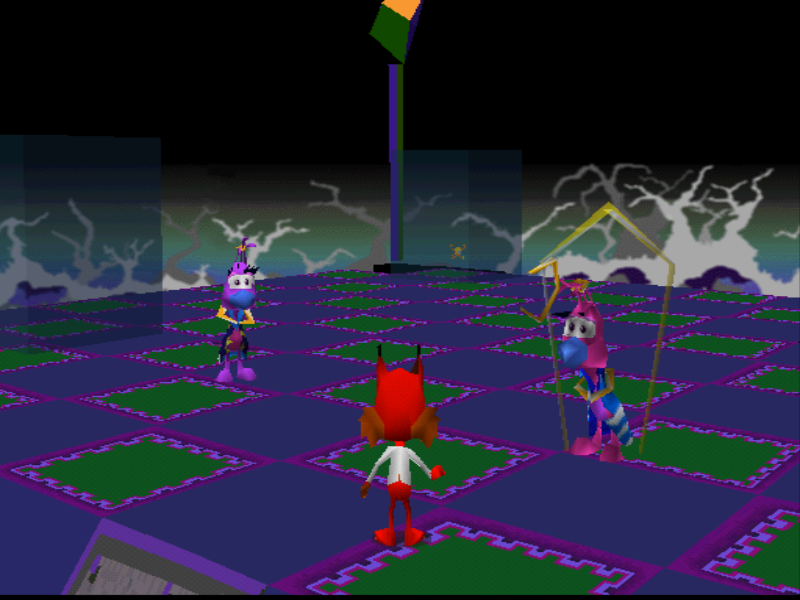 When they started, few developers had seriously attempted to make a fully three-dimensional game. Of those who tried, only a handful could be said to have succeeded – and even then, countless growing pains were involved. I can imagine Mr. Berlyn felt elated to make the world’s first good 3D platformer. Bubsy had spent his first two games being a follower; now, it was his chance to be a leader. All of those good feelings came crashing down the minute he laid eyes upon Nintendo’s Super Mario 64 demonstration. It serves as a reminder that many great success stories have a loser doomed to fade away. The Bubsy franchise couldn’t survive the one-two punch consisting of Super Mario 64 and Crash Bandicoot. Those who purchased a Nintendo 64 were treated to what 3D gaming would entail from that point onward. Although Crash Bandicoot wasn’t as polished as Super Mario 64, it meant Bubsy 3D couldn’t even rely on its PlayStation exclusivity as a selling point. The result was a game that aged horribly within seconds of its release. Given how unfortunate the story behind the development of Bubsy 3D was, one might be hesitant to condemn it completely. After all, many of the ways in which Bubsy 3D falls short is only obvious in hindsight. They were in a situation in which they couldn’t have known what was or wasn’t good game design. Unfortunately, the reality is undeniable; Bubsy 3D is indeed one of the worst games of the nineties. The primary reason I can say this is because, at the end of the day, most of the biggest issues with Bubsy 3D had existed since the series’ inception. The 3D presentation didn’t create new problems as much as it exacerbated old ones. The level design is as confused as ever, the Bubsy’s newfound voice is even more grating than his old one, he can’t reliably defend himself, and the controls are still imprecise and floaty. Therefore, while fans of the original two games openly wonder how the wheels could have fallen off the Bubsy series as violently as they did, I can say the fourth installment just happened to be when critics at last stopped ignoring its myriad, persistent shortcomings. I was hoping you’d cover this legendary game! I remember it at the time, it seemed to be an effort by Sony to roll something – anything – out to detract from Super Mario 64. But well, it failed badly. For the time the 3D isn’t actually that bad in the stills, but the execution of the game looks horrific. Lovely! It’s interesting because most times I see someone review Bubsy 3D, I could tell they did so without having played any of its predecessors. It doesn’t really matter because it’s easy to label it a 1/10 game regardless, but I have to say Bubsy 3D fails not just because it’s a terrible attempt at 3D gameplay, but because it demonstrated that Accolade team hadn’t grown as developers in the three years since Bubsy’s inception. Every problem not caused by the 3D leap was present in the ostensibly average-quality 2D installments (e.g. : the confused level design and Bubsy’s general worthlessness); they were just more blatantly obvious and therefore impossible to ignore this time around. Many of these problems admittedly aren’t obvious without the power of hindsight, but even at the time, it was clear what it had to offer wasn’t anywhere near the level of Super Mario 64 (or even Crash Bandicoot). In short, it looks bad and plays even worse, so I’m glad I was able to convey that with stills. Glad you liked the review! Look at that! An arrow! Aren’t these game designers wonderful?! These guys were patting themselves on the back without cause way before Naughty Dog made it cool. But, no – the answer is no. I haven’t read this, but I wanted to comment that I put your review into a word counter and it ended up being about 4,200 words and oh my loooooooooooooooord. Yeah, I don’t settle for doing things halfway. If anything 4,200 words for me means it’s a little on the short side (for the sake of comparison, my longest review is in the 13,000 word range). That’s a very good way to sum up the game’s tragic story. I can barely imagine how Michael Berlyn felt when he caught a glimpse of Super Mario 64. I was taken aback at how sad this backstory was, and I can imagine Mr. Berlyn felt devastated; he realized right there and then he had been defeated. Nonetheless, I ended up giving the game a 1/10 because a lot of the problems with Bubsy 3D existed in previous installments; there just wasn’t anything to counterbalance them this time. Respect for grinding through this awful game. Reading about the history of the series is interesting too. The story of a failure like the Bubsy series is sometimes more interesting than the story of a success. Thanks! It was worth it just to see all of your reactions. I liked reading about this story because it made me consider the success of Super Mario 64 from their competitors’ perspective. It’s honestly kind of sad. As I’ve said in the past, I don’t like the idea of breaking my own grading scale. The 1/10 is the obligatory point for the developers having finished the game (in a manner of speaking). I can respect ambition. I’d rather play a game that tried to be great and failed than a game that shot for average and hit it. But there is a price to that. And sometimes, that price is Bubsy 3D. So, you going to be covering the new Bubsy as well? On a side note, why do you do this to yourself? You went into Bubsy 3D on purpose. I’m worried about you. Yeah, as weird as it sounds, I actually have a little more respect for Bubsy 3D than its predecessors (or even games I thought were better such as Tri Force Heroes). Even so, it is undeniably a terrible product that is just as guilty of worsening old problems as it is introducing new ones. I think I will cover the new Bubsy in the future, though I haven’t decided when. I know, I have no excuse for that, do I? Mostly, I do it for my audience because I actually respect them. I know that’s not the mark of a professional critic, but I think I’ll manage.